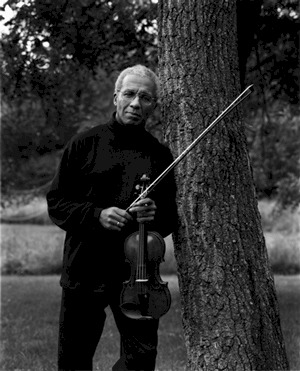 Sanford Allen started his study of the violin at the age of seven and entered the Juilliard School of Music at age ten. He continued his education at the Mannes College of Music where he studied the violin with Mme. Vera Fonaroff. His career in music has been one of significant accomplishment. In 1962 he became the first black musician to become a regular member of the New York Philharmonic Orchestra. He remained with the orchestra until 1977. He has been responsible for numerous commissions and first performances of contemporary composers in general and black composers in particular. Mr. Allen has played recitals and participated in chamber music concerts in many parts of the world. His solo appearances with orchestra have included the Symphony of the New World, the Quebec Symphony, the Baltimore Symphony, the Miami Philharmonic, the Detroit Symphony and the New York Philharmonic. Mr. Allen taught at Livingston College of Rutgers University, advised the New York State Arts Council and served on the Executive Board of the Kennedy Center National Black Music Colloquium and Competition. He has advised the High School of Performing Arts in New York and the Performance Faculty at Rutgers University. Mr. Allen joined the noted jazz pianist and composer, Sir Roland Hanna, in the premier performance of his Sonata for Violin and Piano at the Kennedy Center. He selects the Leaf Peeper programs and invites other world-renowned musicians to join him in performance of old and new music. CCCC commissions a chamber music work each year, one of the organization’s exciting aspects. Over the last decade, the CCCC has performed commissioned works by Carman Moore, Roland Hanna, Coleridge-Taylor Perkinson, Noel DaCosta, Roque Cordero, Mark Suozzo, Richard Robbins, Ron Carter, Kenny Baron and David Loeb. Sanford Allen was appointed Director of the Clarion Concerts Leaf Peeper series in 1996 following the death of Newell Jenkins, founder. This year Tania León has been commissioned to compose a string trio in honor of Mr. Allen's 15th year as Musical Director of the CCCC.